The flight was diverted to Stansted Airport following a suspected "hoax" security alert. 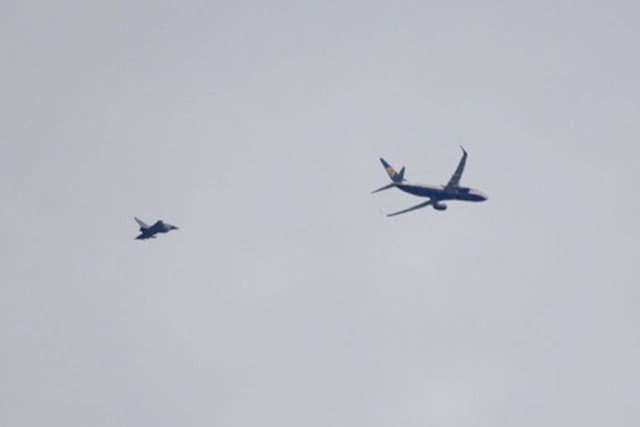 Two RAF Quick Reation Alert (QRA) Eurofighter Typhoon jets intercepted a Ryanair flight and diverted it to Stansted Airport due to a suspected "hoax security alert", Oct. 4. The Boeing 737 was diverted from its Kaunas (Lithuania) – Luton (UK) route to Standsted airport (UK) according to the procedures. Stansted is a designated airport for dealing with hijacks and major security alerts. The aircraft landed safely at approx. 9.00 am and passengers were safely brought off. The runway was closed during the landing phase and re-opened in a short time. The Coningsby Typhoon aircraft were authorized to fly at supersonic speed for operational reasons and a sonic boom has been heard in Suffolk. The Essex Police have shortly completed investigations of the incident and announced on Twitter that no suspicion was found.